Welcome to summer! I know to people in other parts of the country this may sound ridiculous and obvious, but up here for some reason, the weather just doesn't get the whole early summer idea. I'm pretty sure I saw 57 and 59 on the thermostat a few times this June. Luckily the temperature finally decided to get it's act together... now I just wish it would coordinate with the rain and clouds. As in, make them go away. Even if I can't get what I want, this dish is a great fit for summer (whenever it decides to show up). The mixture of cheese, fresh herbs and lemon filling just scream "summer" at you, and the light sauce is a refreshing change from those heavy meat-laden tomato-based sauces. While yes, it does take a little bit of time to put together, I think it's well worth it. To prepare ravioli, place ricotta in a cheesecloth-lined colander (a coffee filter will also work); drain 30 minutes. Combine ricotta, 1/4 cup Parmigiano-Reggiano, and next 4 ingredients (through egg), stirring until well combined. To prepare the dough, lightly spoon flour into dry measuring cups; level with a knife. Combine flours and 1/2 teaspoon salt in a food processor; process 30 seconds. Combine 5 tablespoons water, 1 tablespoon oil, and eggs, stirring well. With processor running, slowly pour water mixture through food chute, processing just until dough forms a ball. Turn dough out onto a lightly floured surface; knead 6 times. Shape dough into a disk. Dust dough lightly with flour; wrap in plastic wrap. Let stand 30 minutes. Divide dough in half. Using a pasta maker (or a rolling pin and a floured surface) roll out the each half of pasta into 15 x 6-inch sheets. 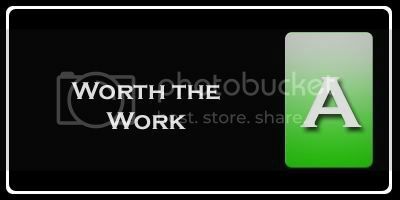 Cut in half lengthwise (so you will have 4 total sheets that are 15 x 3-inches). Place 1 (15 x 3–inch) pasta dough sheet on a lightly floured surface. Spoon 1 1/2 teaspoons filling mixture 1 1/2 inches from left edge in the center of sheet. Spoon 1 1/2 teaspoons filling mixture at 3-inch intervals along the length of sheet. Moisten edges and in between each filling portion with water; place 1 (15 x 3–inch) pasta sheet on top, pressing to seal. 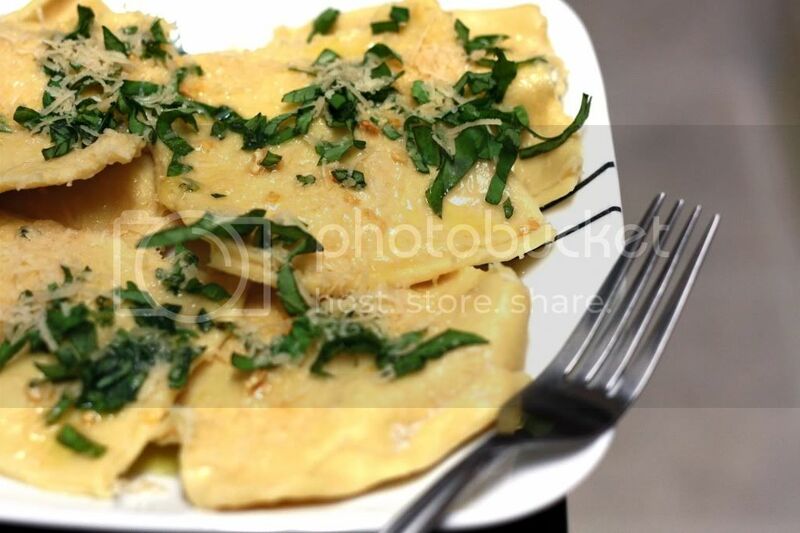 Cut pasta sheet crosswise into 5 (3 x 3–inch) ravioli, trimming edges with a sharp knife or pastry wheel. Place ravioli on a lightly floured baking sheet (cover with a damp towel to prevent drying). Repeat procedure with remaining pasta sheets and filling mixture to form 20 ravioli. Bring 6 quarts water and salt to a boil in a large pot. Add half of ravioli to pot; cook 1 1/2 minutes or until no longer translucent. Remove ravioli from water with a slotted spoon. Repeat procedure with remaining ravioli. To prepare sauce, heat oil in a large skillet over low heat. Add garlic to pan; cook 6 minutes or until garlic is tender. Remove from heat. 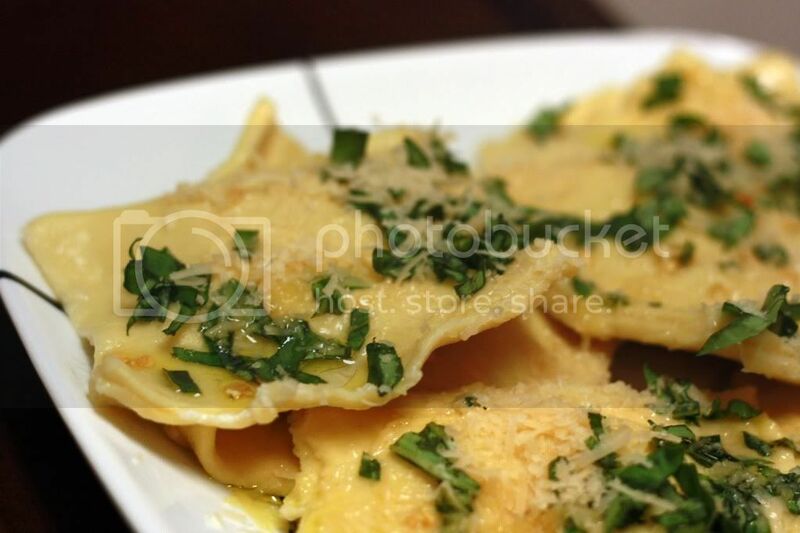 Place 5 ravioli in each of 4 shallow bowls; drizzle each serving with 1 1/2 teaspoons garlic oil. 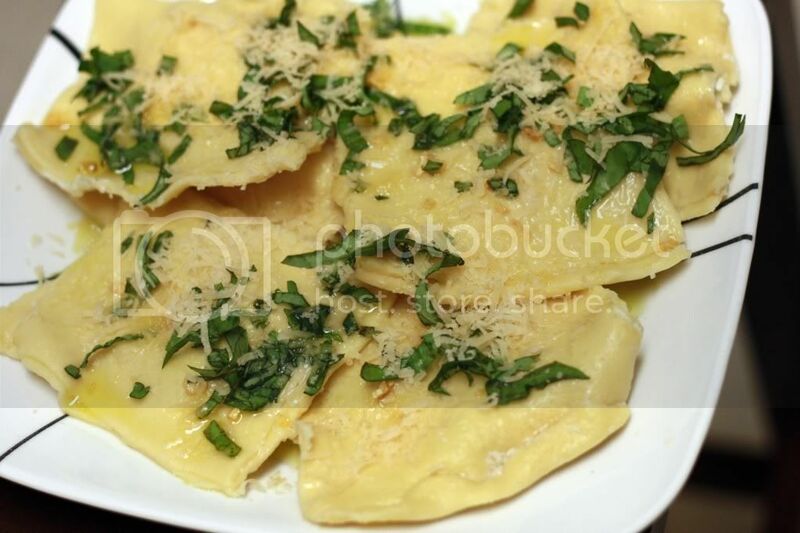 Top each serving with 1 tablespoon basil and 1 tablespoon shaved Parmigiano-Reggiano. Serve immediately. Now, the sole reviewer of this recipe on MyRecipes.com claims that it was good but you could just as easily get this in the store. I totally disagree with that. First off, I have never seen this type of flavor combination in the store -- it's usually just your typical meat or cheese ravioli. Second, fresh pasta is what makes this dish. Since the flavors and the sauce are so light, it really makes the pasta the star of the show. Hence why you would NOT want to use dried pasta in this case. I say use your favorite pasta recipe -- whether it's made with all-purpose flour, semolina, whole-wheat, whatever and it's sure to be delicious. Usually I'm all about substituting dried herbs for fresh ones for speed and cost. However, this is once again, NOT the dish to do that in. The way I see it, why bother going through the trouble of making fresh pasta if you're going to fill it with dried ingredients? If you're going to spend the time to make the pasta, you might as well spend a little bit more chopping fresh herbs. While it's true this isn't a quick meal to make, it's definitely a tasty one.